The Bedroom is one of the older rooms in the house. 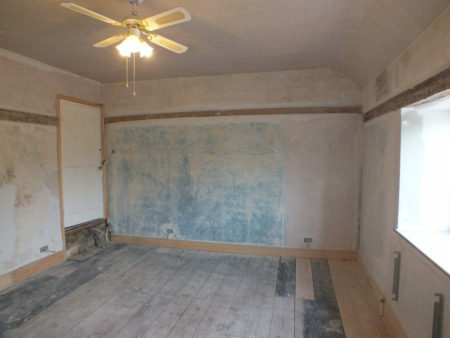 The blue colour is distemper on top of haired lime plaster on wattle and daub. 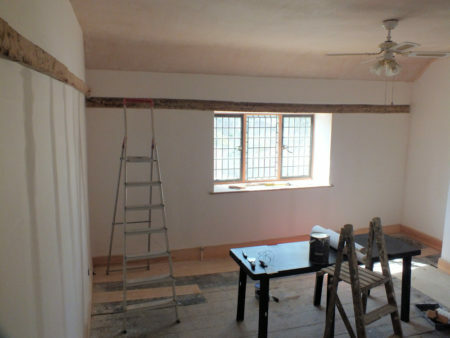 The pink (a gypsum skim over lime) was applied by the people* who filled in the door opening to the right, raised the ceiling, then chopped a new door opening through the wall plate! *I’ve been calling them Edwardians but it seems that Gypsum became popular only after WW1 when skilled plasterers were killed and a new generation took over. The remodel was complete before 1926 and started after William Thomas became landlord in 1910. I’m going to change my estimate to 1920. I’ve exposed the beams (I think the wall plates were originally exposed or hidden by the ceiling. The tie beam was originally above the ceiling). The original plaster was protected by wallpaper and is still in reasonable condition after several hundred years. 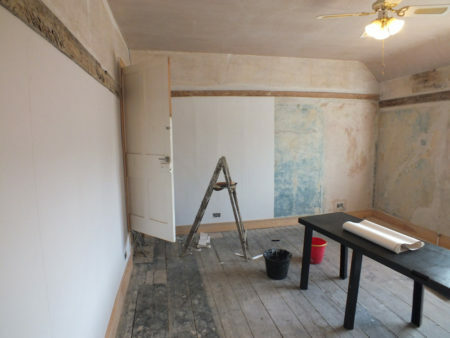 Originally lining paper was applied before paint, and it is is lovely to be able to take off layers and layers of paint and get back to nice smooth plaster using only a wallpaper stripper. So I’m being nice to future restorers and covering the original plaster back up with lining paper before paint (using a cold water paste so the paper can come off again in the future). It is my first time wallpapering and lining paper seems forgiving. On the far wall the outline of the timber frame is quite visible through the paper. It looks a lot better with the lining paper finished. I went for maybe 0.5mm or 1mm gap between the sheets, then painted the joints, then used filler to hide the gap. The paint allows the filler to be sanded a little and the joints in the paper aren’t noticeable after paint. 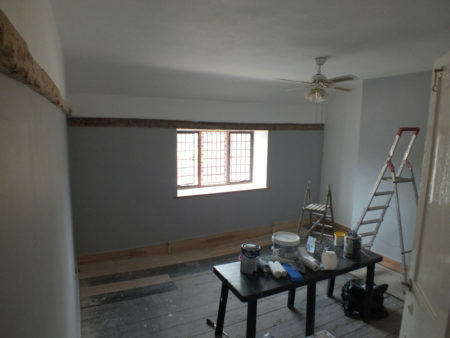 A bit of paint later and the room is closer to being finished. Ceiling needs another coat and I might yet continue the wall paint past the beams towards the ceiling. I did end up painting up to the ceiling above the beams. Looks more balanced, but there is something very nice about bare wood against white walls. This entry was posted in Decorating, History on June 3, 2018 by malcolm.